Many Asian American and Pacific Islander organizations within the National Council of Asian Pacific Americans had an overall positive response to President Obama's final State of the Union address and spoke in support of a range of issues he highlighted, from health and education to voting rights and opposing xenophobia. Below are some of the highlights of our responses, with links to the full statements. National Director Christopher Kang issued the following statement: “Tonight, President Obama not only declared that the state of our Union is strong, he emphasized the need to understand what makes us strong—our diversity, our respect for one another, and our standing up for one another. He challenged us to see ourselves as ‘Americans first, bound by a common creed,’ and as we seek to meet this challenge, I hope that Americans will do the same and see Asian Americans and Pacific Islanders—and those of all communities of color, religions, and backgrounds—as Americans first. APIAHF President & CEO Kathy Ko Chin: "Nearly six years after enactment, the President’s signature achievement, the Affordable Care Act (ACA), has brought historic changes to our communities. More than 17.6 million people now have health coverage, including millions of Asian Americans, Native Hawaiians and Pacific Islanders (AA and NHPI) who gained coverage through the Marketplaces and expanded Medicaid. Before the ACA, nearly one in seven AAs and NHPIs were uninsured and even more were underinsured. Now in the middle of the third open enrollment period, we at APIAHF are honored to be a part of Action for Health Justice (AHJ), a national collaborative working with community partners and in-person assisters in 22 states to close the health insurance gap." APIAVote Executive Director Christine Chen: "We agree with the President's call to make it easier to vote—not harder. The right to vote is at the cornerstone of American democracy, and efforts to impede or complicate access to the ballot box must be stopped." "Instead, making it easier to participate in the political process should be the focus of all of our lawmakers. Our democracy is only strong when all voters have an equitable say in our government and politics, when the voice of all Americans can be heard." "Initiatives across the country such as online voter registration, expansion of early and absentee voting, and automatic voter registration are key to ensuring that America's future as a representative democracy remains bright." 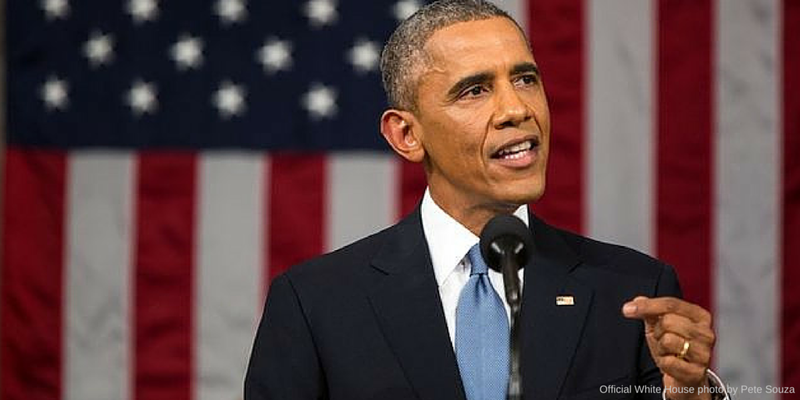 NAPAWF Executive Director Miriam Yeung: “President Obama’s final State of the Union address celebrated his accomplishments and highlighted the best attributes of our country while underscoring the substantial challenges we still face. Asian American and Pacific Islander women know all too well the injustices of the current immigration system. We have personally felt the sting of xenophobia, fueled by increasingly ugly rhetoric. We are frustrated by an economic recovery that continues to build the largesse of the one percent, without substantially raising wages and improving benefits for working families — especially women, who are paid less than our white, male counterparts. Our reproductive rights are challenged by organized forces who want to roll back the clocks on women’s rights and are limited by racial inequities, language barriers, immigration and economic status." "Under this Administration, our country has seen great economic recovery and growth. As we look to continue our economic growth, we must invest in supporting small businesses in our communities. Thriving small businesses will lead to strong local economies and ensure that we, as a country, continue to innovate and lead in areas such as energy efficiency and job creation. We thank the President for his commitment to lifting up small businesses and asserting that the rules should work for small business owners and workers, not against them." SALDEF Executive Director Jasjit Singh: "When we engage in divisive political rhetoric and attacks on innocent people of faith, we are indeed betraying who we are as a country." "In last night's State of the Union (SOTU) address, President Obama made the case that government must do more to give everyone a "fair shot" to thrive in our society and economy, even as the gap between the very rich and the many poor continues to widen. Education is key to economic opportunity, and we applaud the President's plan to offer two free years of community college to all responsible students. This plan will create more opportunities for Southeast Asian American (SEAA) students, many of whom are first-generation college students or come from low-income families. Across SEAA communities, over half have never attended college, and 40% of our students continue to drop out of high school." 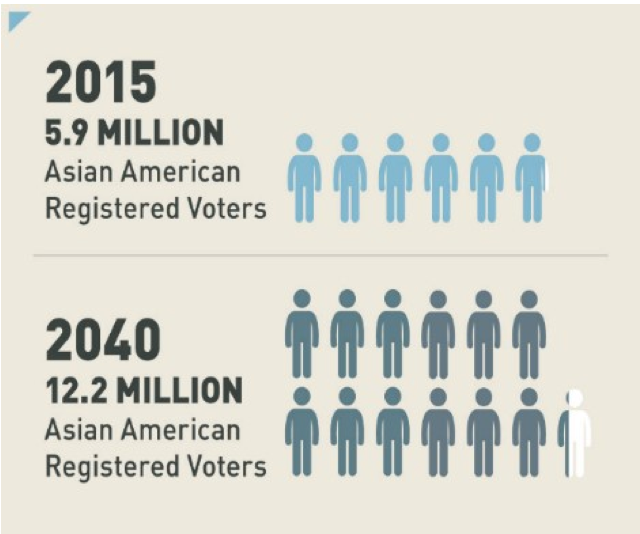 Asian Pacific American Institute for Congressional Studies (APAICS) & UCLA Center for the Study of Inequality graphic showing how the Asian American electorate will double by the year 2040. View this message in MailChimp and sign up for our email list for regular updates.